In Southern California, there is a gentleman we will call Dr. LT that owns not just the first Lexus RC F, but also owns his and hers Lexus GS 350 F Sports. His past cars include a Lexus RX 350 F Sport, and an IS 350. We sat down with Dr. LT to find out what kind of person has such a strong connection to this brand. Normally, in our interviews we ask the person to tell us a bit about themselves. Dr. LT prefers not to live in the spotlight, and so we are going to jump right into the car-talk. Let us first mention though that his current stable and past cars include many of the world’s most sought after near-supercars and classic muscle cars. 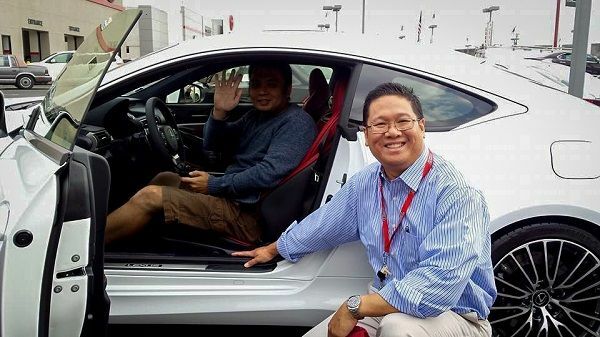 My sales consultant, Mr. Leo Subroto of Longo Lexus always goes above and beyond to accommodate my needs. Leo invited me to an RC F launch event, and I bought the car on the spot. When Leo convinced his managers to let me test drive the first and only RC F. That sealed the deal. Some Toyota employees in attendance told me I was probably the first private owner. Indeed, we checked with Lexus, and they did not know specifically who the first private buyer was, but they suspect it is Dr. LT. We also reached out to new RC owners on the Facebook RC Club and other forums, and we are pretty sure Dr. LT is the first. Dr. LT, please tell us if the Lexus ownership experience is important to you. I had three vehicles being serviced at my Lexus dealer at once, and I did feel special. One time when there was a problem I spoke directly to the mechanic. I have not had any other problems. When we tested the RC F on the track, the RC F's transmission was the biggest surprise. As an owner what is yours? I never expected Toyota/Lexus could build an engine that sounds so beautiful aside from the LFA. Tell us what RC F you have specifically. I was inclined to get the performance package but then I thought about it again and I know that I won’t track this car (I have other cars for that purpose). So, I decided to go with the mechanical Torsen differential instead of the TVD (Torque Vectoring Differential). I also plan to keep the car for quite a while, and I am under the assumption that the Torsen Diff. will be easier to deal with, should a problem arise. Southern California is the land of supercars. Does the RC F stand out? Do people ask about it? It both fits in and stands out. As you know that there aren’t many RC Fs around. I haven’t taken the car out a lot, but my neighbors who know me as a car-guy actually came to congratulate me this time. I’m an introvert by nature, so I don’t try to flaunt the car. Why not a BMW M4 or AMG Mercedes? First, like I said above, I think of the RC F as more of a GT car in the style of the Jaguar F-type. Second, I don’t need another too-fast car. Third, I trust Toyota/Lexus for their reliability as I want to keep this car for a while. I am confident there will be no “fifth-year problem” after the warranty expires. I share your sentiment that some other brands have lost their mojo and Lexus is the “it-car” now, thanks to Mr. Akio Toyoda. Last, but not least, the RC F will be a rare sight compared to the cars you mentioned above. After 1,000 miles how do you like the 2015 RC F? I love it very much. I don’t think it as a sports car, but I think it as a very excellent GT car. I also consider it a bargain. Our thanks to Dr. LT for sharing his story and photographs of the first North American RC F.
In my area (FL) a doctor also bought one of the first RC Fs - lesson: be in a profession where a price list is anathema. Come on John, you wouldn't be happy buying a vehicle without knowing the price :) (no frown). I value the free market, not de facto monopolies. I'm sorry Mark. I didn't understand what you meant. I think I confused the situation. Dr. LT knew the price he would pay. The vehicle he test drove had a Monroney sticker and that was the one he bought. He asked that I not share the exact price he paid, but he did want readers to know that the dealer did not add any markup over MSRP to the asking price. He also mentioned that he was very close to the orange, but decided on white after seeing it in person. As always, we appreciate the comments, particularly from our regular contributors. Thanks again Mark. Belatedly, I can see that my remarks weren't clear. What was meant: In the medical profession (doctors) no price list is ever shown. The patient is hit with a bill (usually outrageous), after the "service", that may or may not have fixed the patient. So doctors are buying expensive vehicles that most patients can't afford. Price gouging is the realm of monopolies. Forking over 80 grand for that thing (as opposed to an AMG, M, RS or Boxster/Cayman, CTS-V or *saving* money on a Corvette or a LOT of money Mustang) has got to qualify as some sort of mental illness. Ugly. Slower. Less engaging. Less exciting. Less cachet. I get it. The Dr is a Toyota *mega* fan. More power to him. I'm going to guess that there are not a *ton* of "Toyota mega fans" happily ready to fork over *more* money than the Euros charge for *less of everything* in an ugly package that looks *identical* to the $30k bog standard RC. I own one of these and it is simply one of the best performance vehicles around.. hands down! NO other vehicle beats the naturally aspirated exhaust sound and the technology put into the transmission and shifting mechanism is impressive. Even though it does not have a double clutch, shift are just as fast in manual mode. It is just a perfect vehicle! It seems to have the superior reliability of Toyota without any of the issues that are in other similar brands. I'd advise though to not spend anywhere $80k... get one certified pre-owned with low mileage for about $25-30k less! They aren't hard to find either given that the model has been been available for over 2 years now... No regrets folks! I always smile when I drive in to work.. I'm easily the king of the road (when I want to be ;-) at all times, =). It's good to read info from an owner.